The Western Pwo Karen Literature Support Youth Group has provided textbooks and teaching aids to 1,765 Western Pwo Karen (Phalon) teachers from eight townships in the Ayeyarwaddy Region. The group’s campaign officer Sa Khwar Khwar said the group has started providing the aids since March with the aim to promote Western Pwo Karen literature, which has become weakened. “The literature and language of our Western Pwo Karen people have weakened compared to other Karen people. Karen literacy has declined due to a decrease in Karen language speakers. So, we are doing this to uplift our literature. We hope for the re-establishment of Karen national schools like in the British colonial era,” Sa Khwar Khwar told Karennews on April 3. 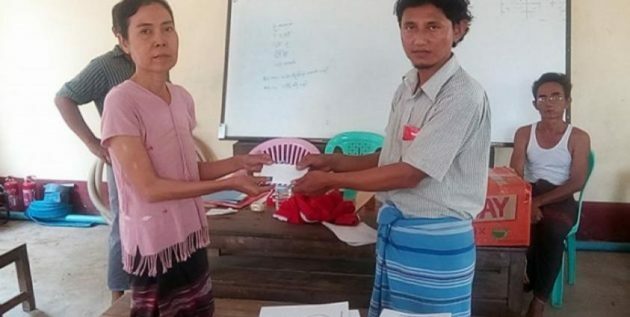 The group has provided kindergarten textbooks, exercise books, and pens to 1,765 teachers from 25 villages in Kangyidaunk, Wakema, Yekyi, Kyonpyaw, Nyaungdon, Ma-ubin, Labutta, Kyaunggon townships. “We conducted field surveys and provided the aids to the first villages that contacted us. The teachers are trainees from respective township literature and culture groups. Everyone is under respective township literature and culture groups,” said Sa San Min, training supervisor from the Western Pwo Karen Literature Support Youth Group. Karen youths who are working abroad are the key supporters of the group and the group has been providing these aids every year since 2014. Local Karen youths and Pwo Karen youths working in Malaysia, Thailand, Singapore, and South Korea established the Western Pwo Karen Literature Support Youth Group in October 2014 with the aim to support and promote Western Pwo Karen literature.